Yesterday, we finally made the trip south to a home near Evergreen, CO to buy a used canoe that is in beautiful condition. It was a solid hour and a half drive down, but it was another gorgeous day in Colorado, so we decided to take even longer on the return home. We took the scenic route (i.e., back roads through the mountains) and it lived up to its name. Around every corner was another stunning view of mountains or meadows or canyons. 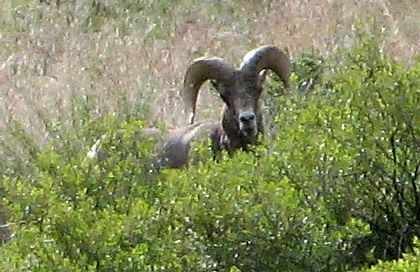 The Big Event: we were treated to the sight of three bighorn sheep grazing on a hillside right by the road. It was hard to miss them – there were people standing by the road and staring at them through binoculars and cameras. 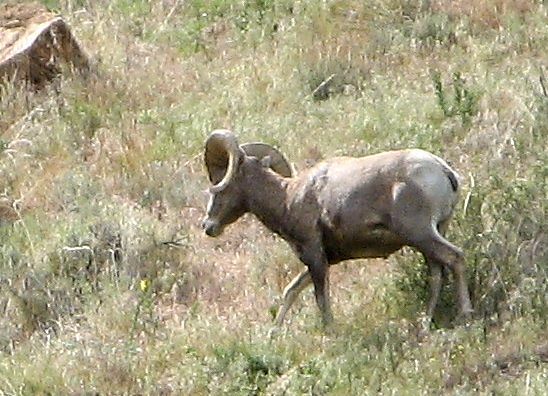 It was the first time I had ever seen bighorn sheep in the wild. They were a lot bigger than I expected. 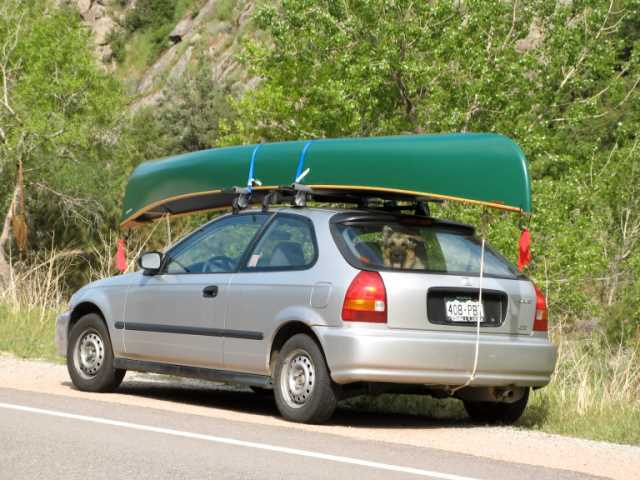 The other fun thing about yesterday was seeing the canoe strapped to my car. It’s longer than my Honda by over two feet, but we figured out a secure way to tie it down and it turns out it’s not that hard to drive the car with the canoe in place. We took Cora along for the drive, and here’s a picture of the complete package: car, canoe, and Cora (she’s looking out the hatch window). 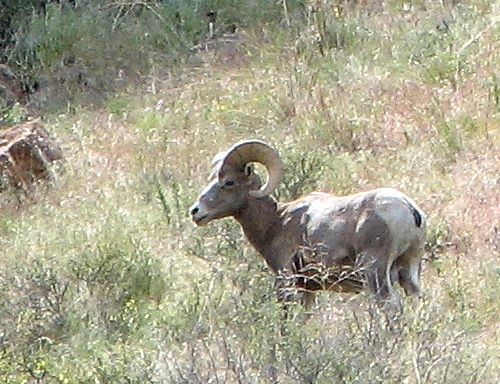 When you travel from Canon City to Salida on highway 50 you can see big horn sheep. The only problem is they are usually standing where it’s difficult to pull over or get pictures of them. Canon City use to have big horn sheep off of highway 115 between Canon City and Florence.They have been moved out of the area.